Blog The One Inch of Fish Per Gallon Rule: Truth or Myth? The One Inch of Fish Per Gallon Rule: Truth or Myth? Many aquarists swear by the standard rule of “one inch of fish per gallon” rule. Is it a hard-and-fast rule, or more of a guideline? A well-stocked aquarium is truly a thing of beauty. How gorgeous it is to watch beautiful fish swimming tranquilly amongst carefully chosen plants, rocks, corals, invertebrates and decorations! Getting to this point can take a lot of careful planning. As an aquarium owner, you’ll spend plenty of time researching, investigating and deciding which kinds of fish you want to keep, as well as which will thrive best in your tank. It’s an ongoing process that can provide you with many hours of pleasure. How many fish can you safely keep in your tank? You might be surprised how often aquarists neglect this important question, especially beginners. It can be tempting to add all the beautiful fish you fancy, but over-stocking can have disastrous results. Your fish can end up starved for oxygen, diseased, poisoned or even dead. Here is where the “one inch of fish per gallon” rule (or one centimetre per litre, if you’re outside the US) comes into play. Let’s go deeper on some of the things you need to consider when thinking about the “one inch of fish per gallon” rule. What is the “one inch of fish per gallon” rule? Does the “one inch of fish per gallon rule” actually work? “one inch of fish per gallon” rule? The “one inch of fish per gallon” rule is a handy rule-of-thumb, NOT a golden standard. It can be a good way to think about your fish-to-water volume ratio – but of course, there are exceptions to every rule. Many aquarists interpret the rule to mean that for every gallon of water in your aquarium, you can stock one inch of fish. If you take this rule at face value, it would mean that a five-gallon tank can hold five inches of fish. A ten-gallon tank, 10 inches. And so on. Many aquarists get tripped up when they try to apply the “one inch of fish per gallon” rule, as there are a range of mistakes that are easy to make. But of course, fish grow! A fish that’s one inch long in the pet shop can easily grow to six or eight inches when it’s an adult – or more, depending on the species. You have to consider the maximum size of the fish when they are mature. There can be a big difference. This is an easy mistake to make. You might have a 10-gallon tank, but once you’ve kitted it out with substrate, plants, rocks and ornaments, you’ve made a significant dent in the available volume of water capacity. A 10-gallon tank might actually hold only 8.5 – 9 gallons of water once it’s fully established. You can safely assume a margin of 10-15% less water than the size of the actual tank. Make sure that you do your homework so that you aren’t unintentionally adding more fish than your tank can handle. The thing about rules is that there are exceptions to all of them. That’s why the “one inch of fish per gallon” maxim should be thought of as a guideline, and not a hard-and-fast rule. The rule works as a rough estimate, but there are plenty of things it doesn’t take into consideration. For example, do you have live plants in your tank and if so, how many? What kind of filtration system are you running? What kind of species are you planning to stock? Here are some things to think about when you’re considering the “one inch of fish per gallon” rule. 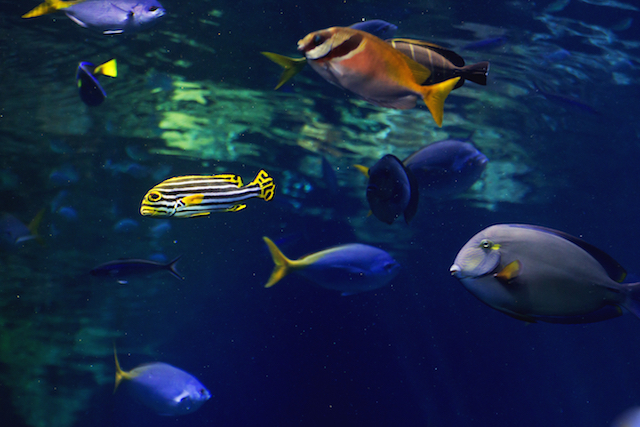 Just like people, fish come in lots of different body types. A round, fat fish takes up a different amount of space in a tank than a slim, longline variety does. And a fish that is “tall” but slim will take up a different amount of space again. Consider, for example, how different a discus fish is to a solidly-built goldfish. This is one reason why the “one inch of fish per gallon” rule isn’t definitive. 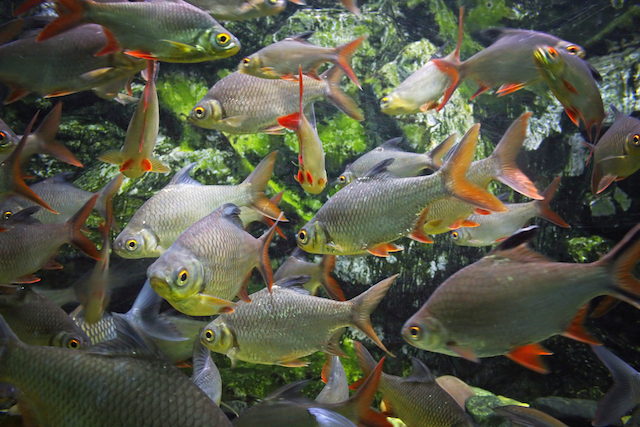 Little fish such as danios and tetras produce low amounts of waste – but big eaters like goldfish and plecos will produce higher amounts. The more waste there is in your tank, the more beneficial bacteria you’ll need to break it down. That means if you’re going to stock fish that produce more waste, the “one inch of fish per gallon” isn’t such a good rule of thumb. You’ll also need to keep up with regular water changes, and ensure you have a good filtration system or a higher volume tank that can effectively dilute the harmful chemicals that your fish release into the water, such as nitrogen and ammonia. As you research the kind of fish you plan to stock in your tank, you’ll learn what kind of space your species need. Some fish need plenty of room to swim because they’re active and playful, such as danios; or perhaps you want to keep schooling fish that need a much higher volume of water volume to move around in together. Other types can be very calm or inactive, like dwarf corydoras or clownfish, and so they will need less room. This will have major implications on how many fish you can safely keep in your tank. Compatibility is very important. Some fish will live together in perfect harmony, but if you get two aggressive males of one species in one tank then the rule becomes completely useless. The same goes for mixing species who don’t like to co-habitate – for example if you try to put clownfish or damselfish together then you’re in for some trouble. Keeping your fish happy and healthy is a delicate balance of factors including oxygenation, filtration and other considerations. The size and the shape of your tank is something you need to plan as well. Surface area and oxygenation are important. The larger the surface area of water in your tank, the more oxygenation you can expect in the water – and that will support a larger number of fish. If your tank is tall and thin, it might have the same water volume capacity as a short, wide tank, but they’ll have very different surface areas. You can use the surface area rule to help calculate how many fish you can stock safely. You arrive at this number by multiplying the width of your tank by its length (width x length = surface area). If you use this rule, you can usually stock one inch of fish for each 12 square inches of surface area. Of course, this rule isn’t failsafe either – it’s got many of the same issues as the “one inch of fish per gallon” rule. If you’re going to keep wide-bodied fish you can change the calculation to one inch of fish for every 20 inches or surface area. Even if you’ve followed all the advice, calculated your surface area, accounted for compatibility and activity levels and done everything you’re meant to do – you can still create problems if you add your total number of “safe” fish all in one go. That’s dangerous! Your tank needs to build up its biological load to deal with their waste products and chemicals. Adding all your fish at the same time could overwhelm the balance and mean that you end up killing your fish by mistake. Make sure you add your fish slowly, and regularly test the ammonia and nitrate levels in the tank. As they continue to read low or negative over at least a few weeks, your tank is adjusting to its new inhabitants. Then you can gently add a few more. Read out in depth guide to start a saltwater aquarium if you want to learn more. 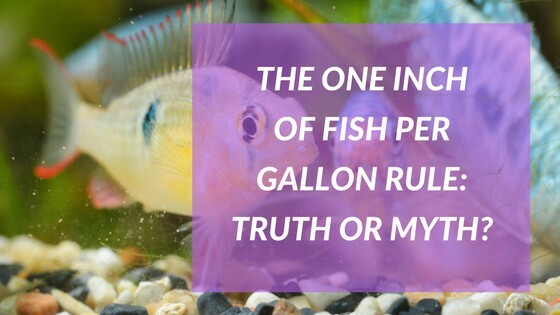 It’s clear that there are many factors you should consider when you’re stocking your aquarium and thinking about the “one inch of fish per gallon” rule as the golden rule can lead you to make serious mistakes. It’s better to think of this rule as a guideline rather than as a failsafe measure. The amount of fish you can safely stock in your tank will depend on a lot of different things. The most important part of your decision is doing the research beforehand so that you’re making an informed decision. Do your reading, visit the forums, check out the different online calculators that can provide guidance on the issue, and you’ll be on your way to giving your fish their best chance at a happy, healthy life in your thriving aquarium.